Overcast, filled with the perpetual noise of scooters and horns, green parks, and many dreamy lakes Hanoi is a charmer of a city. 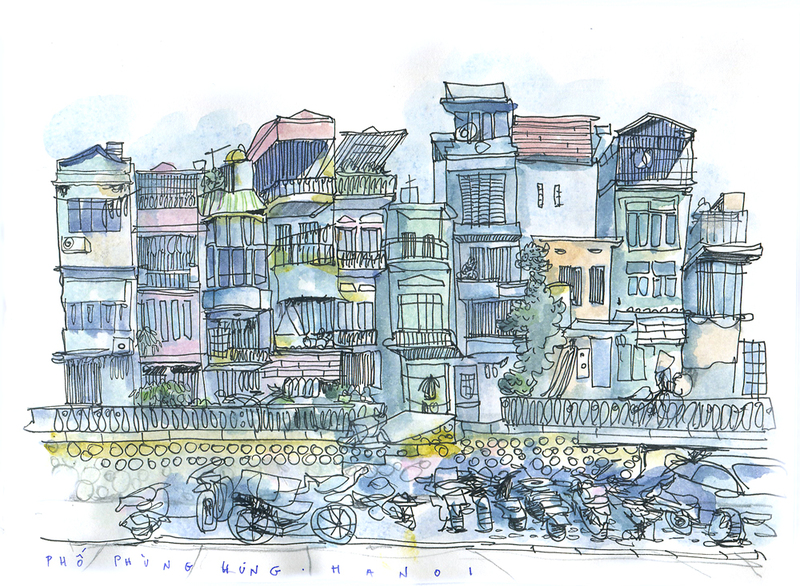 Here is the very first drawing of Hanoi sketched from a park bench in one of the city's lovely green parks. Vietnamese parks are very actively used by people exercising, reading, practicing their dance routines. The building on the left is the Department of Foreign Affairs. 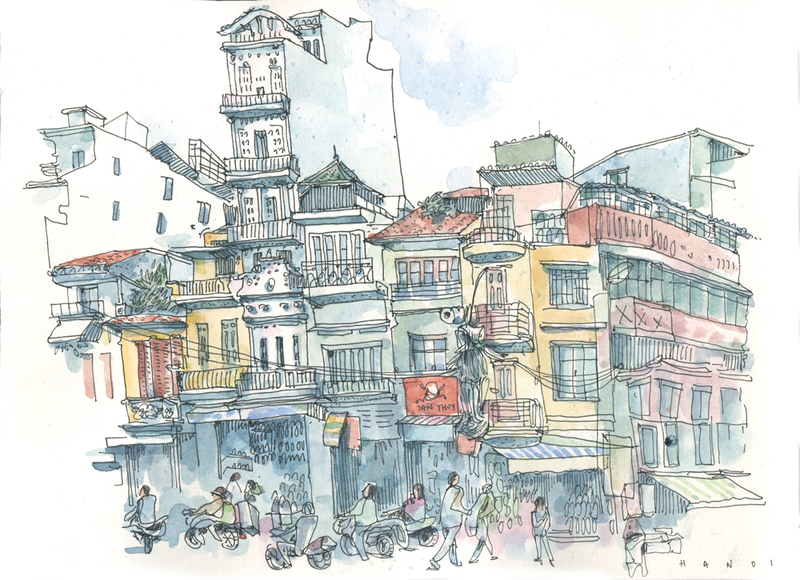 Structures in Vietnam tend to be tall and thin with the first floor almost always opening up into a dark ally with its many vendors and sidewalk restaurants–typically just makeshift ovens with giant simmering pots of pho and omnipresent plastic stools. 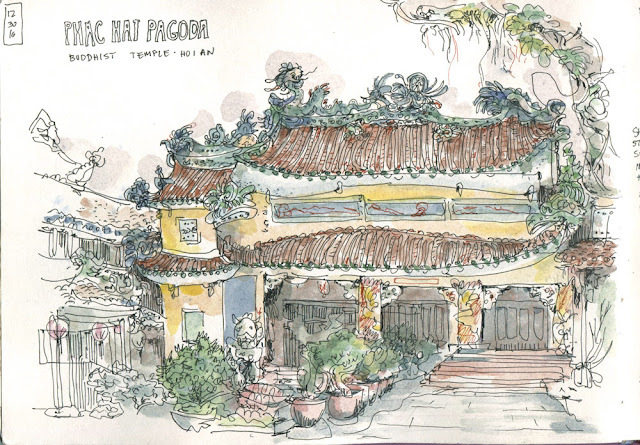 The architecture definitely bears a mixture of Chinese and French influences–the main two of the many cultures that occupied Vietnam. The walk in the Old Quarter is a fight for survival of sorts–trying to dodge flying scooters, and low hanging electrical wires that hang and twist in giant heaps right overhead. Sidewalks are used for parking cars and scooters, and sometimes for riding scooters as well. Whatever space is left is usually occupied by vendors and outdoor terraces. Pedestrians have to share the road with the rest of the traffic, forced out from the sidewalks. 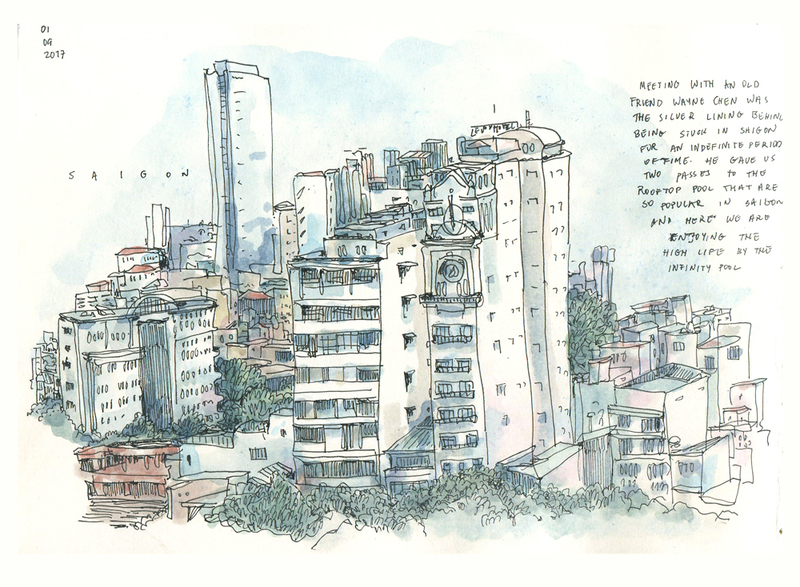 This is sketched from a little waffle house situated on the third floor in one of the buildings on the northern end of Hoàn Kiếm Lake. We watch the procession of Santa Clauses on scooters. 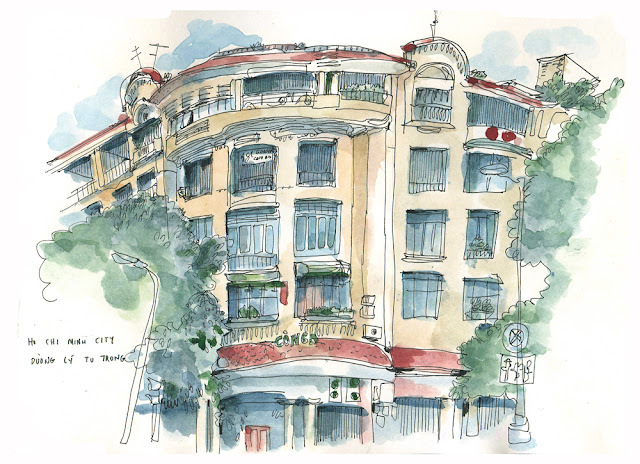 the city is submerged in perpetual traffic, dotted with many outdoor cafes and markets. A long walk to another famous Hanoi lake–Truc Bach Lake rewards us with a really picturesque neighborhood. We later learn that this is where Senator John McCain's plane went down during the Vietnam war. He was dragged out and taken as a prisoner of war by the Vietnamese. The lake is seriously polluted, yet the locals continue to fish its poisonous waters. Sketching the lake from the peaceful Trấn Quốc Pagoda garden with the sounds of the city. in the background. At last found some vegetarian food in Hanoi at the Minhchay Vegan restaurant. Traditional pho for breakfast, rice paper salad rolls, and steamed rolled rice pancakes–all washed down with thick Vietnamese coffee. Vegetarianism in this country is tightly associated with Buddhism. There are two days a month–at the beginning and the middle that typically require from a buddhist to adhere to vegetarian diet, and those are the days when vegan restaurants see a great increase in their customers. More of Hanoi's whimsical architecture lining up a busy highway-like street right outside of the Vietnamese History Museum. The woman in the signature triangular hat in front of me sells lottery tickets to anyone who wants to try their luck. Struggling to stay awake I make this sketch in a dark, stuffy room witnessing the bizarre world of the Vietnamese Water Puppet theater–strange harmonies and singing bordering on screeching. Next morning jetlag forces us early out of bed and we get to witness Hanoi waking up to the drizzling rain and the loud speakers typically playing some propaganda-type news casts. There are many groups of mostly women doing Jazzercise workouts with the leader at the front of the pack and a boombox broadcasting western pop music. We buy one of those famous boat tours of Halong Bay which proves to be absolutely amazing. The wooden boat slowly glides the emerald waters of the bay situated three hours east of Hanoi. 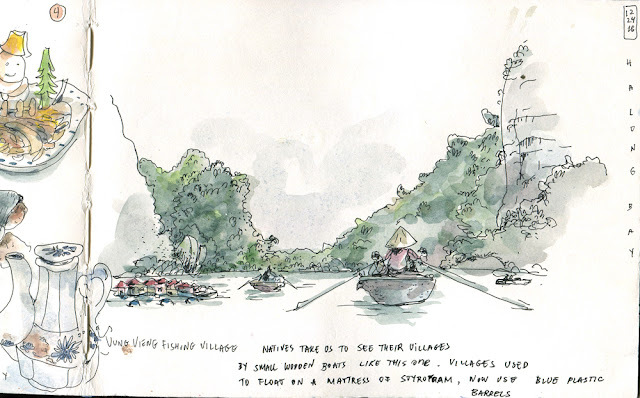 Sketching Halong Bay from the moving boat is an unparalleled experience . Consisting of thousands of karst islands the bay is the UNESCO world heritage site. A little Dutch girl Valerie took a hold of my brush mid-sketch and had made some important artistic contributions in the bottom right corner. On the boat the crew meticulously takes care of our every wish and need. One of the elaborate 8 course dinners accompanied by food sculptures and a talent show by the crew on board Legend of the Dragon boat. It was hard to work out the vast amount of food we were offered even with kayaking and swimming activities. The most unique aspect of life on Halong Bay is that there are communities living here right on the water, a phenomenon known as "floating villages". People make their living by fishing, growing pearls and now, tourism. The villages used to be built by floating simple structures on mattresses of styrofoam. Due to the ecological concerns styrofoam has been replaced with plastic barrels. Yet, the proper trash disposal and sewer remain ongoing concerns. 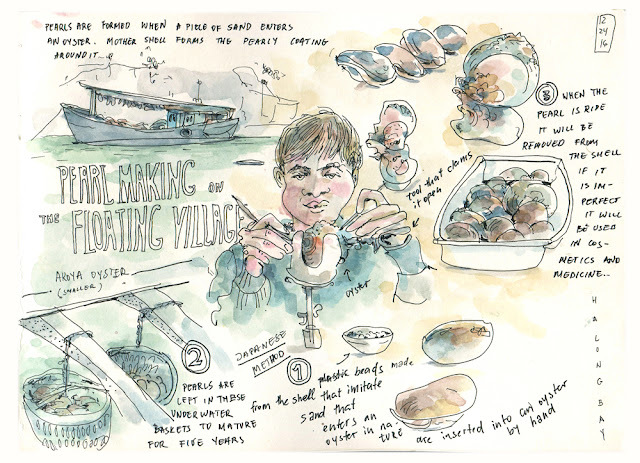 Besides fishing and fish farming pearl making is another way floating village inhabitants make their living. Here I sketched the so called "Japanese method" of making pearls where a small round peace of a shell is inserted inside an oyster with the precision of dental work being done. The oyster is then submerged under water for 5 years to let the pearl mature. They are being monitored and cleaned periodically until they are opened and, the hopefully, a perfect pearl is extracted. On Christmas Eve I learned to make vegetarian spring rolls on board our boat "Legend of the Dragon". Only 10 minutes to sketch this, the rest of the time is for rolling the delicious filling inside the crunchy rice paper. One of the days on the boat the crew prepared lunch right on a beach surrounded by the majestic karst mountains for the passengers. I stayed behind and sketched the scene from the big triangular tub in our cabin. I felt like that was the most indulgent sketching set-up in my entire lifetime. The indulgent life on the boat was over too quickly and we were catching a rocky overnight train to the former Vietnamese capitol of Hue. Hue is most famous for the giant Imperial palace that took more than 200 years to complete building and takes a day to see. The complex consists of many impressive monuments surrounded by motes and thick walls. The palace was pretty badly damaged during the Vietnamese American war and is still being rebuilt today. 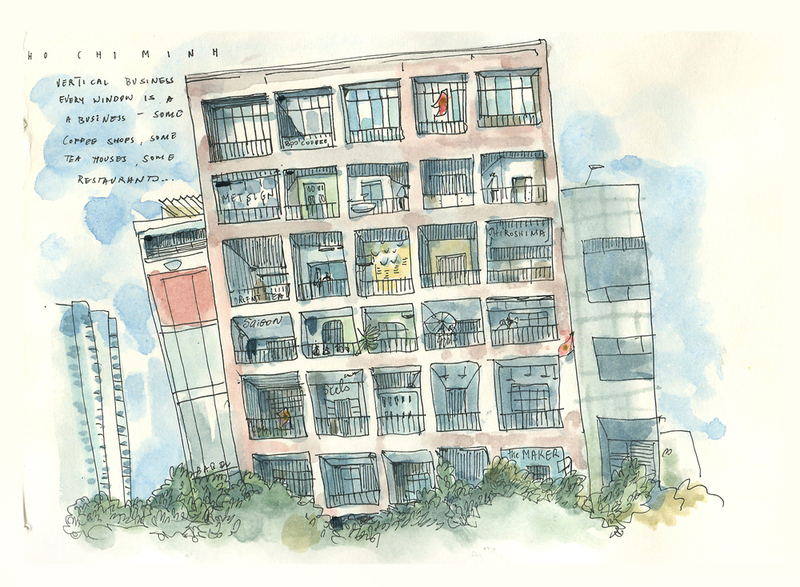 Sitting by the pond and sketching the Imperial Library was very meditative. Next on our itinerary is the atmospheric town of Hoi An, and old Chinese port built on the banks of the Hoai river. Once a bustling port, the town turned into a beautiful museum once the river silted too much for the ships to be able to make it to the port. The town is complete with many great examples of Chinese architecture, buddhist temples, and many colorful lanterns that light it up in the cozy warm glow every night. We arrived just as another wave of rainy weather was setting in. Last one caused major flooding in this low sitting town. Really wet cool weather causes me to come down with a cold. 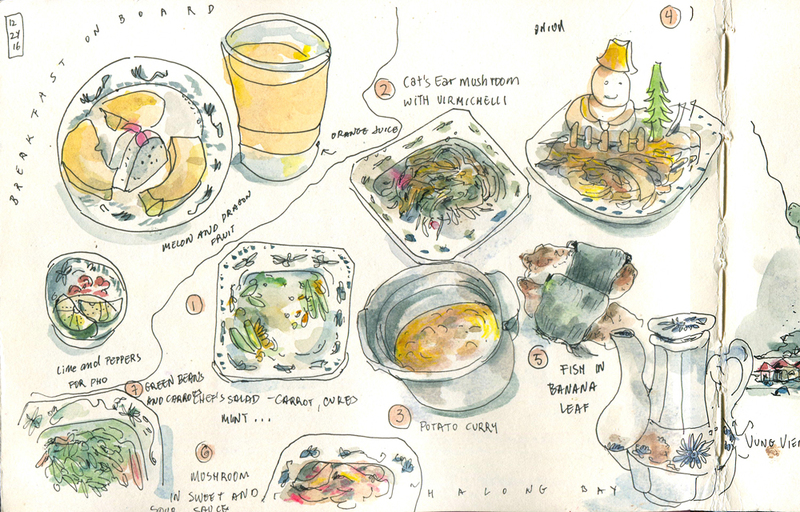 I spend a few days blowing my nose, sketching and gulping down tons of pho and ginger tea. Anyone who still prefers to doubt climate change needs to visit central Vietnam where once idyllic beaches are now mostly lost to erosion as a result of rising sea levels. Once the pride and joy of Hoi An the beaches around the area are currently landfills of discarded beach furniture, lined for miles with giant sand bags that serve as futile defense against the angry oceans threatening to swallow up nearby homes. Fading billboards inviting visitors to partake in the paradise are in stark contrast with the reality. 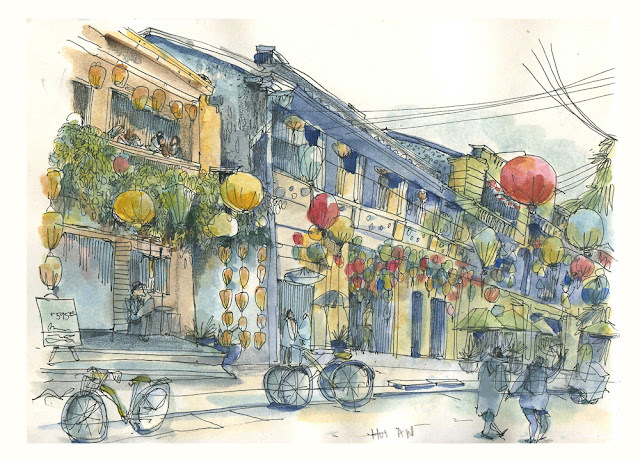 Hoi An is full of amazing examples of Chinese architecture. 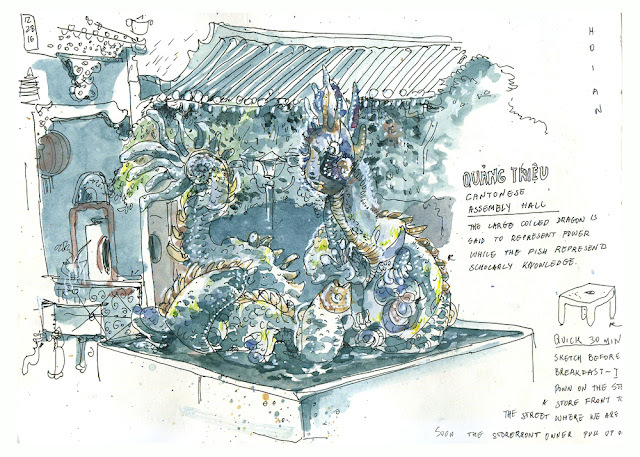 This sculpture found in the Cantonese Assembly Hall is another take on the popular theme—coiling dragon that represents power and koi fish representing knowledge. Here is a sketch of the last day of 2016 from the terrace of one of Hoi An's splendid cafes. One of the main tourist attractions–the Japanese bridge is visible on the left. We didn't get to hear the guitarist Hoang Dang play his guitar but got a sketch of him eating lunch in his kitchen while watching a Vietnamese soap opera on TV. This is a sketch of Phac Hat Pagoda. I had to periodically go inside to dry off as the rain would pick up and my colors would start to run down the page. Studying the anatomy of a perfect Buddhist shrine with this sketch. Symmetry appears to be important, so is the color red. There is always incense sticks smoldering away, piles of fresh fruit, fake money, candles, flowers, cookies, rice wine and tea. Then things get weird—cans of soda and cigarettes? Someone actually lights up 5 cigarettes all at once at this shrine. It turns out that the lower level represents offerings to the deceased relatives. They are offered things that they really enjoyed and indulged with during their life time. Celebrating New Year's Day with the vegetarian versions of some of Hoi An's classic dishes. Vietnamese pancake wrapped in rice paper with fresh herbs... White rose is a gentle layer of rice dough wrapping with a small morsel inside and crunchy onions on top... Morning glory- sautéed water spinach with plenty of garlic. Very charismatic driver who took us from Hoi An to Danang and told us about running behind American soldiers when he was a little boy in Hoi An. This idyllic island in the South China sea hides pretty sinister past. It has housed a large political prison until the mid 1970ies using the system of torture that came to be know as Tiger cages. People would be confined to small cells, starved, and repeatedly tortured by the guards who would poke them with sharp sticks through the openings in the ceiling. The prisons are now open to visitors, bearing state of eerie authenticity due to the fact that little attempt has been made to make it look like a museum. Some cells contain life like sculptures intended to show what was going on inside. Con Dao still has a very alive fishing industry. 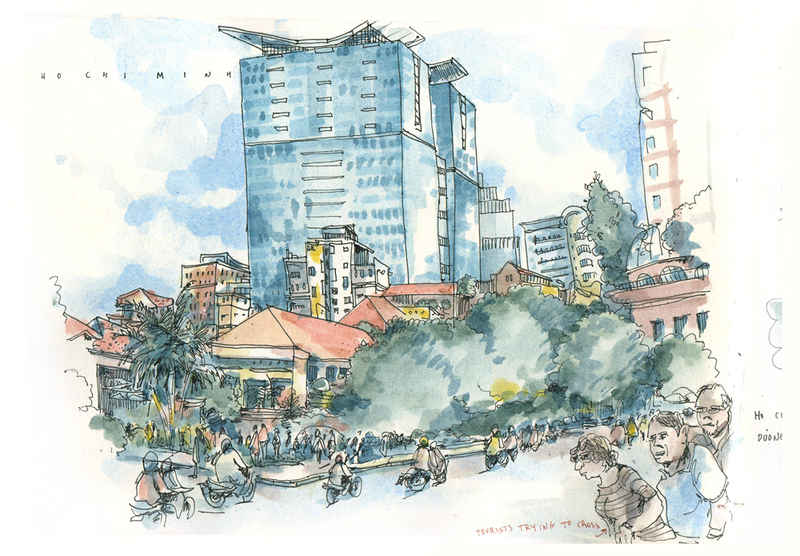 This sketch is done on Cảng Bến Đầm pier where colorful boats bring in the fresh catch, dry squid on clothes lines. We befriend a fantastic Vietnamese entrepreneur and avid hiker Sao. He offers to take us to the undeveloped parts of the island on long hikes through the dense forests to various secret beaches. At the end of So Ray Plantation hike Sao takes a nap in the hammock on the chill Ong Dung Beach. The tide is too low to go swimming. As he naps Sao is holding on tightly to his backpack, the necessary measure of precaution in this area where wild monkeys would open it and steal your stuff. We are all clutching our bags nervously as we are surrounded by numerous wild monkeys who are stealing bananas right out of our bags and causing further monkey mischief. We stop for some food at a simple road side café that specializes in all things snails. There is a display of at least 10 different kinds of snails that could be prepared in the infinite number of ways. Some of the more famous methods include coconut milk broth or chile and lime juice. With the help of Google translator and gestures we order our meal. While we are dining the owner's wife is tenderly working her little garden of many different herbs and one big bright flower in the middle. Here is Sao and the view of Trang Bay only reachable to boat or foot through the dense forest. Last stop of the journey is Ho Chi Ming City, formerly Saigon–very energetic large city where the amazing Vietnamese history weaves in with the forward, future oriented society, always capable of snapping back and moving forward. 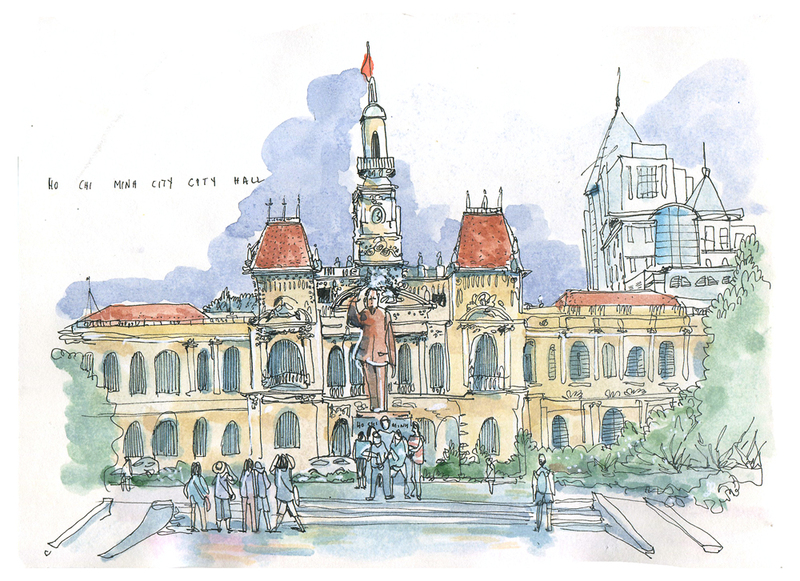 Here is a sketch of the iconic central post office in Saigon in the style of French colonial architecture. Outside lots of opportunities for people watching from the newly weds posing for a photo shoot to an entrepreneurial doughnut seller balancing a pile of his goods on top of his head. Good morning Saigon! Started this sketch right after the sunset and finished it with the sunrise from the little balcony of our hotel. Depending on the time of the day the glass Bitexco tower always reflects or displays some psychedelic array of colors. Going to Vegetarian restaurants in Vietnam is almost a religious experience. This is especially true with Vegetarian Hum—the Taj Mahal of veggie restaurants. Pictured here is the main bar area that is constructed entirely of fresh fruit, vegetables and the live green wall all coordinated by various hues of green. Tourists waiting for the stream of mopeds to stop, nervously looking left and right before they cross the street. The scooter stream never stops, when the light changes they just start coming from the other direction. Unlike tourists natives just blindly and confidently step into the steam of traffic as if they own a lifetime punch card—use 10 lifetimes, get 1 additional life for free. Uncle Ho statue and tourists in front of the City Hall in Ho Chi Minh city right after a rain storm. Ho Chi Minh is well loved in Vietnam. His mausoleum is in Hanoi, and even though uncle Ho wanted to have his ashes scattered in the Northern mountains, his body was embalmed upon death by the same Russian Jewish family who embalmed Lenin, Stalin, and Mao. Every year Ho Chi Minh's body has to take a trip to Moscow for maintenance. Vertical storefronts. Some are restaurants, some are tea houses, many proudly displaying the bright red Vietnamese flag. A friend gave us a couple of swimming pool passes to a rooftop pool. Not a bad way to spend the last hour in this crazy, fun, and energetic megapolis. Something tells me that this specimen has been curing by the pool with his beer for a few decades. After at least 20 vegetarian pho soups, 50 near collisions with the omnipresent scooters, a book full of sketches, and a lifetime worth of memories we were ready to say good bye to Vietnam. As it turned out, Vietnam was not ready to let us go. The loose page entry visa got lost out of my passport in one of many transits and the authorities decided to put us through the worst soul grinder of the Vietnamese bureaucracy to get another visa. Now it is a lot of waiting while I am sketching this pagoda next to the immigration department and hoping to make my case before the benevolent Buddha of whoever is overseeing the Vietnamese bureaucracy.